For years, a presence was seen after Clubfoot’s death. The man, whose real name is Sergeant Sinclair, is said to be seen walking around on the perimeter road and his ghost was seen on the runway, arms waving wildly in the air. He is frequently seen limping along the perimeter track, or attempting to flag down vehicles. Gazing at the vast, sparse landscape of ex RAF Binbrook, a glimpse in to the past is possible. The remnants of a bustling base are still here, preserved in time, untouched for years. Like any destitute place, the air seems filled with a whisper from the voices that were once an integral part of the life and blood of this base. A longing to know where all the workers have gone is uncontrollable. The feeling that for those people, the day the base shut down, life stopped for them. The perspective of the runway is hypnotising, and the open air carries the history. It is fascinating thinking of this small village and its impact on World War II. It is the perfect example ofLincolnshire’s importance in the past. People have said they have seen Clubfoot, dressed in 40’s clothing, stalking the perimeter and airfield. The devoid and barren landscape makes the sightings of Clubfoot a sinister thought: That he alone, from a workforce of plenty is stuck to walk the airfield companionless. I can feel the lives that worked this base pulsating through the rundown bunkers and tarmac, but I did not see Clubfoot. RAF Binbrook was a Bomber Command station during World War II. After the war it was amongst others the home of the Central Fighter Establishment. The Royal Air Force base at Binbrook sits high in the Wolds with a commanding view overLincolnshireit was established in 1940 and was in service for almost half a century – home to the legendary Lancaster Bombers right through to the Lightning jets. 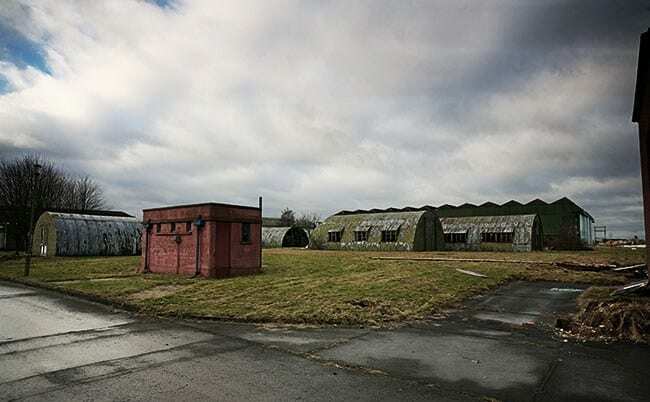 The airbase opened despite being unfinished and soon became one of the biggest Wellington Bomber airbases in the country. Eventually it played host to probably its most famous guests the Royal Australian Air Force and the Lancaster Bombers. As of 2010 most of the buildings remain. The technical buildings and the hangars form an industrial estate. The accommodation blocks stand, disused. The flight line is fenced off and used for storage of mainly ex-military equipment awaiting resale. The married quarters are private housing, forming the newvillageofBrookenby.